For decades, it’s been one of the best-known myths on the campus. In February 1917, on a late night road trip to Austin, a group of Texas Aggie pranksters managed to capture and brand the University’s first longhorn mascot “13-0,” the score of a football game won by Texas A&M in 1915. 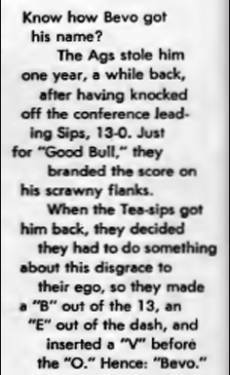 Embarrassed by the incident, UT students hurriedly altered the brand to read “Bevo” by changing the “13” to a “B,” the “-” to an “E,” and inserting a “V” between the dash and the “0.” It’s been standard newspaper and magazine fodder for years, published in the Texas A&M yearbook (photo at left, from 1964), and Aggie fans have proudly touted the stunt as the reason the steer acquired his name. But was the brand really altered? And is that why he’s called Bevo? Sorry, Aggies. Wrong on both counts. Above: From a page in the 1964 Texas A&M University yearbook. It’s been a longstanding myth, likely dating from the 1930s, but research at the archives of both UT and A&M has shown it to be incorrect. November 30, 1916 was a Thanksgiving like no other. Mayor Alexander Wooldridge thought it quite possibly the greatest event in Austin’s history, and publicly floated the idea of a special tax to fund it as an annual celebration. The city’s downtown train station was besieged by arriving crowds, hotels were overrun, sidewalks were bustling, and streets were packed with no less than 1,000 out-of-town cars. The Austin newspaper compared Congress Avenue to Broadway in New York City. 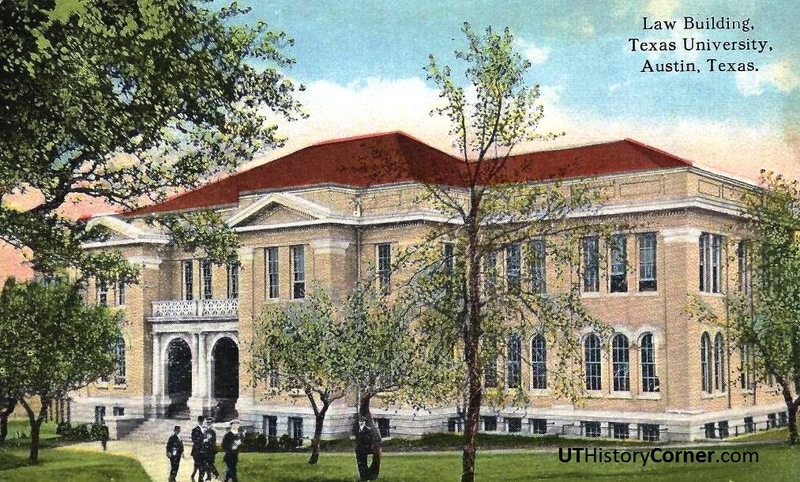 For the last two days of November 1916, the University of Texas held a grand homecoming celebration for thousands of returning alumni, the inauguration of a new UT president, the first Texas vs. A&M football game in Austin in seven years, and the birth of a Longhorn tradition. Above: The old Main Building, floodlit for the first torchlight parade and football rally. The festivities began Wednesday evening, November 29th, with the first recorded torchlight parade and outdoor football rally. Most of the 2,600 enrolled UT students participated. The men carried homemade torches, while the co-eds held colorful Japanese lanterns. The students marched together up the south entrance of the campus to the old Main Building—floodlit for the first time—then down the hill to the southeast to a natural amphitheater just north of the old law building, where the Graduate School of Business building now stands. Joined by another 3,000 onlookers, the crowd sat on the ground under starry skies for two hours to hear rousing speeches, sing college songs, and shout UT yells, including the favorite Rattle de Thrat. At 9 a.m. on November 30th – Thanksgiving morning – another parade set out from the campus toward the Texas Capitol for the inauguration of Robert Vinson as the new University president. Seniors wore special armbands, engineering students sported their trademark blue shirts and khaki trousers, and freshmen huddled in green caps. The faculty, by a vote of 30-20, elected to wear academic regalia en masse for the first time, though the robes had to be rented for $3.50 per person. Above: UT Faculty in academic regalia for the inauguration of President Robert Vinson. Most enjoyed the colorful spectacle, with only a few minor disappointments. ”Dr. Joe Gilbert looked quite gorgeous,” explained Professor Harry Benedict, “until somebody caused his feathers to droop by telling him that he had on not a doctor of medicine’s gown but a bachelor of divinity’s.” Organizers were quick to adjust the program to include the surprise arrival of Watt Gregory, an 1885 graduate then serving as U.S. Attorney General under Woodrow Wilson (and for whom Gregory Gym is named). There was enough pomp and oratory to last all morning. After the inauguration, lunch was served on the Forty Acres. A boxed meal for 25 cents was available for those who wanted to picnic on the campus. Those who preferred to splurge on a more traditional feast crowded into the “Caf,” an unpainted, leaky wooden shack that somehow managed to function as the University Cafeteria. The full turkey dinner cost 50 cents. The afternoon was reserved for the much-anticipated football bout with the A&M College of Texas. A record 15,000 fans packed the wooden bleachers of Clark Field, the University’s first athletic field near 24th Street and Speedway, where the O’Donnell Building and the Gates-Dell Computer Science Complex now stand. 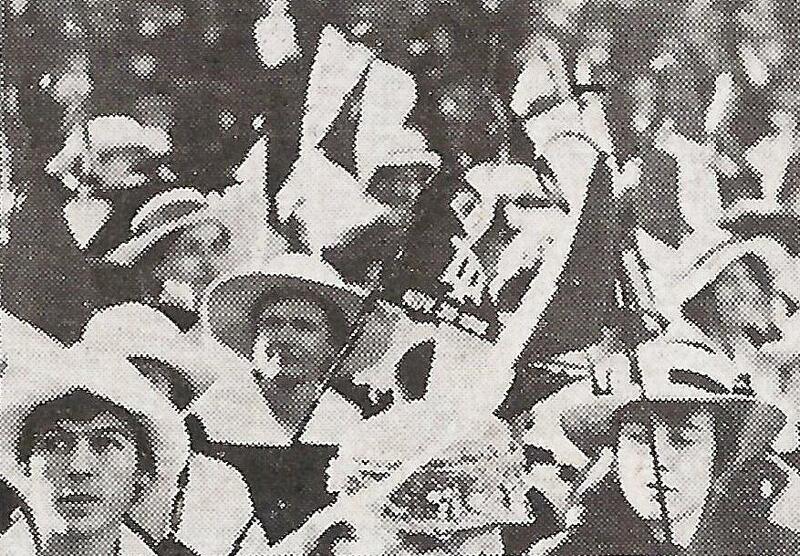 Above: A special football pennant (a little faded after a century) was created to mark the inauguration of President Vinson. Click on image for a larger view. The scene was a riot of color. University supporters waved special orange and white pennants created just for the day, with “Inauguration” and “Nov. 30-1916” attached to to the wide end (photos above and left). Texas Aggie fans proudly sported red, white, and blue ribbons on their lapels. (Maroon wouldn’t be used for another decade.) Though A&M was heavily favored, the first two quarters were a fierce defensive struggle, and the half ended with the score tied 7–7. During an extended halftime, yell leaders from both sides each led cheers in honor of the other school. The A&M Corps of Cadets, decked out in their formal gray uniforms, took the field and marched in the shape of an enormous “T” to the approval of everyone. Above: The debut of Bevo: halftime of the 1916 Texas vs. A&M football game. Click on an image for a larger view. Afterward, two West Texas cowboys dragged a frightened longhorn steer onto the field, where it was formally presented to the UT student body by a group of alumni. The idea originated with Stephen Pinckney, a 1911 law graduate, who had long wanted to acquire a real longhorn as a live mascot for the University. While employed by the U.S. Attorney General’s office, he’d spent much of 1916 in the western plains of the state to assist with raids on cattle rustlers. A raid near Laredo in late September included a steer whose fur was so orange-tinted that Pinckney knew he’d found his mascot. With $1 contributions from himself and 124 fellow alumni, Pinckney purchased the animal and arranged for its transport to Austin. Loaded onto a boxcar, the steer arrived in the capital city about a week before the game, underfed and in a foul mood. “I went to see about the unloading of the beast the day after he arrived,” wrote Dan Williams, then a UT senior, “and found him amusing small boys … by rushing madly at them when they punched a stick between the horizontal bars of the car.” The steer was transferred to a holding pen and reluctantly posed for a formal portrait. It stood still just long enough for a flash photograph, and then charged the camera. The photographer jumped out of the corral just in time, and both the camera and photograph survived the incident. Above: Bevo’s first (and only) formal portrait. He charged the camera after the shot. Too wild to remain for the second half, the steer was removed to more permanent quarters at the Seawright stockyard in South Austin. In the meantime, the UT football team ran two punts in for scores and won the game 21–7. University students celebrated with a bonfire on the campus, a nightshirt parade through downtown, and a reception and formal dance at the Capitol attended by UT and A&M visitors. With football season over, the steer remained in South Austin while UT students discussed what to do with him. The Texan student newspaper favored branding the longhorn with a large “T” on one side and “21 – 7” on the other as a permanent reminder of the Texas victory. Others were opposed and cited animal cruelty. A few wondered if the steer might be tamed so that it could roam and graze on the Forty Acres. While the discussion continued, March 2 – Texas Independence Day – was unofficially declared as the date to decorate the steer. Above: A branded Bevo! February 12, 1917. Click on an image for a larger view. The debate was abruptly settled early on Sunday morning, February 12, 1917. A group of six persons, which included Texas A&M students, a former student, and others, equipped “with all the utensils for steer branding” broke into the South Austin stockyard at 3 a.m. It was a struggle, but the Aggies were able to brand the longhorn “13 – 0,” which was the score of the 1915 football game A&M had won in College Station the year before. Above: The Aggie pranksters who branded Bevo. Only a few days later, amid rumors that the Aggies planned to kidnap the animal outright, the longhorn was removed to the Tom Iglehart ranch west of Austin. Six weeks later, the United States entered World War I, and the University transformed itself to support the war effort. Out of sight and off campus, the branded steer was all but forgotten until the end of the war in November 1918. With the speech-making concluded, the side of Bevo’s hide—which still read “13 – 0” – was presented to the Aggies. “The head and horns of the celebrated steer are being mounted and are to be added to the various souvenirs of the athletic department,” noted the Longhorn magazine, a monthly published by UT students. As you can see by my email adress I’m a fan . 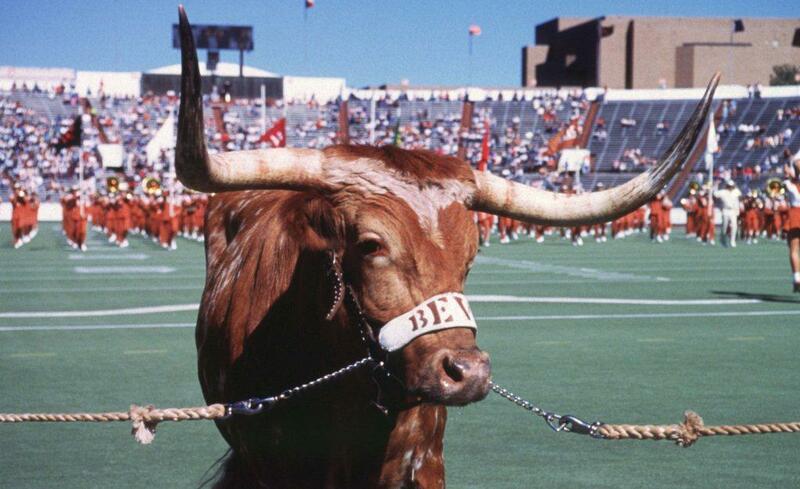 On this week of Tex/OU I’m saddened by the news of Bevo’s illness.He’s been my favorite mascot since I was 3 and that was 53 yrs ago.Ive seen em all come and go during that time and it’s going to be really sad to not see him this weekend in dallas this weekend.we’ll miss him this week and hope for return. Hope this will inspire the team cause they need something. Good luck Bevo! We need U. Hook Em Horns………. Hang-um, Bevos horns that is.